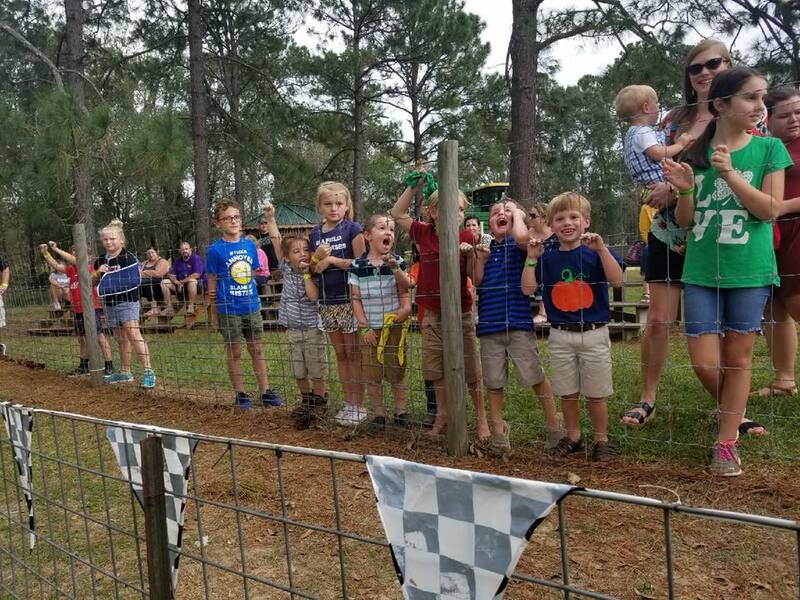 Spring Fun on the Farm - Calhoun Produce, Inc. Adventure awaits you at the farm! 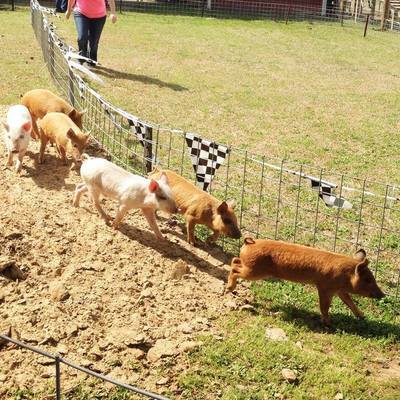 Enjoy Pig Races, Wagon Tours of the Farm, A Large Playground, Duck Race, Farm Animals, Honey Bee House, Strawberry Field and more! On our farm you will have the chance to see a variety of animals. From Alligator to Zebu- we have a medley of both ordinary farm animals and extraordinary exotic livestock! Check out the pictures below to meet some of the four legged staff here on the farm. While you are here explore our popular "Honey Bee House". Watch an educational video explaining the importance of Honey Bees to the existence of American Farms, learn all all about honey production and discover tons of Honey Bee fun facts. The main exhibit is our live Bee Hive viewing area. Watch the bees making the honey and building their hive! 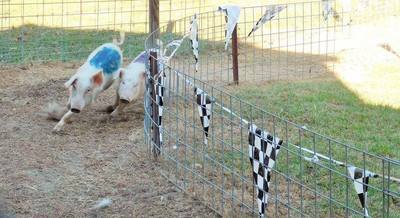 This fun spot on our farm allows you to let your competitive side shine! Race your friends by spinning the crank handle as fast as you can. Watch the water flow and the ducks go! Perhaps the most exciting thing to do on our farm is join in on our Pig Races! After each wagon ride, the tractor will make a stop at the Red Barn to allow visitors to watch the pigs race. Holler as loud as you can for your favorite piggy! If you cheer loud enough, you may even win a prize! *For those who wish to participate in all farm activities during the week the hours are Monday-Friday 9am-12pm and admission is $7/person. 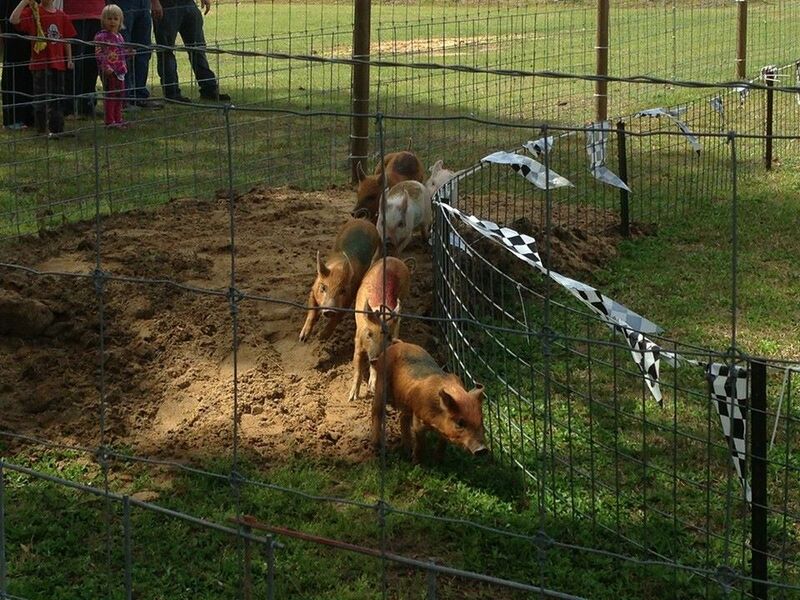 Activities include the wagon ride, pig races, playground, duck race, farm animals, honey bee house and giant slide. After 12pm adults are free and children are $5, the activites will not include the wagon ride or pig race. Calhoun Produce activities are conducted outdoors on an actual working farm. Be aware that visitors may come in contact with animals, bees, etc. Please take proper precautions.